Just as the queasiness in my stomach from the continuous onslaught of curves and cutbacks along the narrow uphill road began to subside, we rounded yet another 180-degree bend. The first waterfall with whipped cream waters dripping down deep-creviced cleavages appeared by the roadside, its beauty washing away all my remaining reservations. The first of many such waterfalls we were to encounter. 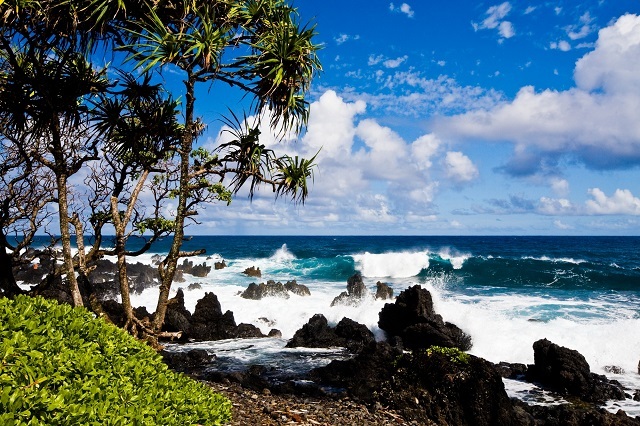 Such is the road to Hana, which traverses the northern coast of Maui in Hawaii, from the rustic village of Paia to its destination at the eastern tip. While only 52 miles long, this series of twists, turns, dips and dives can take up to 3 hours to negotiate. But the ever-present views of lush greenery and ocean blues, vistas of rock and white water foaming up over the shores, and waterfalls bubbling over craggy cliffs are well worth the day-long adventure. The road narrows even further — if such a thing is possible — as the vegetation increases in lushness and hue. I smirked at the sign, “Narrow Winding Road Next 30 Miles,” thinking the announcement superfluous, before an immediate double hairpin turn attested to its validity. Forests of sugar cane, coconut trees and pineapple fields abound, and the banyan trees lean forward suggestively as though to beckon you onward. Still, take time to stop and walk. Sit beneath a banana tree enveloped by giant 6-feet-long leaves. Look out at the wrinkled brown-hued mountains lacerated with ridges created by 2 1/2 million years of rainfall. Look below to the ocean, so varied in color as to simulate every shade of blue contained in even the largest box of Crayola crayons. 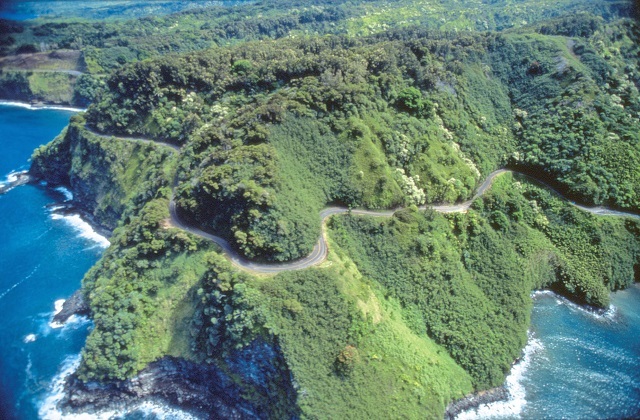 Thus fortified, return to the on-going challenge of the Hana Highway, certainly a misnomer considering its 600 curves and 56 one-lane bridges. Nearby Kaumahina State Park combines a Garden-of-Eden setting with the more practical appeal of restrooms and picnic tables. Be sure to follow the stone-cut nature trail for a dip in the natural swimming pool framed by waterfall and rock — a refreshing antidote to the heat and strain of the drive. If you’re a flora and fauna buff, a stop at the Keanae Arboretum is a must. It’s as close to an Hawaiian jungle as you can get, with a wealth of native trees, plants and flowers visible to the knowing eye. Puaakaa State Park is the next stop — with everything an everyday Paradise should have. The footpath, reminiscent of the road, winds in and out along streams and overlooks. Overlapping paths through multi-colored bushes lead ultimately to a consortium of pools and waterfalls. Irresistibly clear, clean, cool waters flowing in, under, and around rocks entice even the most hardened hold-out. A swing on the Tarzan-like hanging vines overhead adds a dimension to the tropical swimming hole most backyard pools lack. At the rise of another double-U bend in the road is a small roadside stand proffering manna in the form of a variety of native refreshments. Home-grown bananas, papayas, guavas, coconuts and pineapples. While there, we watched the owner, machete in hand, traipse down a nearby path and return with bunches of bananas to meet the demands of the lunchtime crowd. Now that’s fast food made to order! 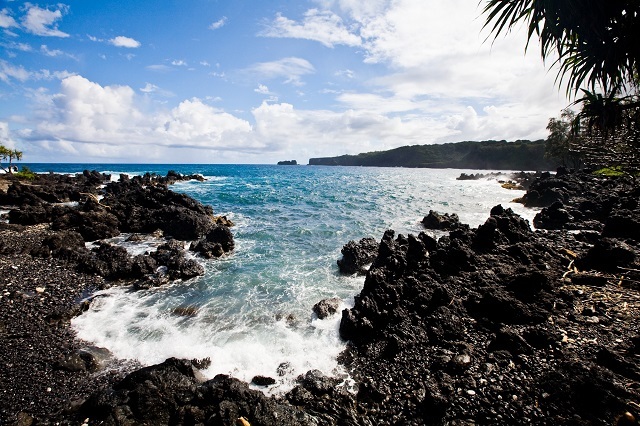 Spirits refreshed and stamina rekindled, a visit to nearby Waianapanapa State Park temporarily transports you into an otherworldly excursion before entering the tranquil town of Hana. 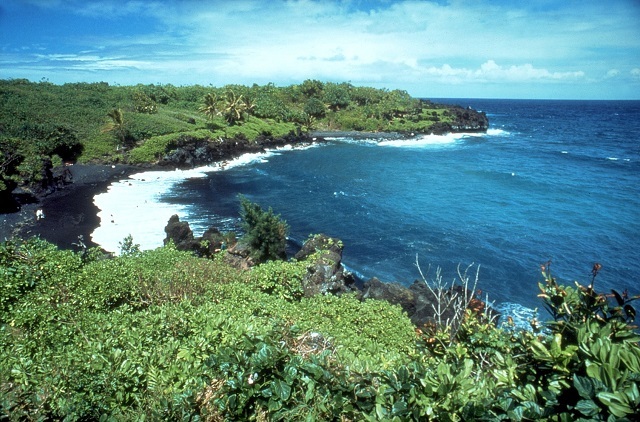 Although the Big Island of Hawaii is better known for its black sand beaches, this park presents its own opportunity to experience this incongruous adornment to a surf-side setting. A steep-stepped path meanders beneath extensive overhangs of gnarled twisted branches, so thick with growth than an eerie darkness prevails even on a sunny day. Hidden within the rainforest vegetation, cavernous rock formations envelop crisp freshwater pools connected by lava tunnels. Lightness and color return with the approach to Hana. Large trees with red-blossom canopies, rainbow-lined sidewalks and green-laden hillsides announce your arrival. However, considering this is the only stretch of civilization in a 3-hour trek, you hardly even know you’ve arrived. A few small stores, the delightful Hana-Maui Hotel, and the presence of people who clearly are not tourists signal the change. A visit to the Hasegawa General Store — immortalized in a 1964 song of the same name by Paul Weston — jolted me out of the tranquil reverie engendered by the town. The small store, well-known for its awesome accumulation of every conceivable item, is so cluttered and cramped that, for me, it conflicted with the airy openness of the natural beauty all around. Still, it is a worthwhile stop, if only to pick up some dramamine — the store’s best-selling item — for the ride back.